As mentioned before, we held a BBQ over the weekend. Because of the excitement of my very last exam I just didn’t feel focused enough to pull off a more complicated recipe, but I definitely wanted a home-made dessert for our guests. These super simple but still delicious sweets literally take 30 minutes and no baking needed. I changed a few elements, but it depends on personal preference, really. Start by taking the butter out of the fridge if that is where you store it, as it has to be soft enough to to be mixed with the other ingredients. Put the biscuits into a large enough bowl, break each into 3-4 little pieces and get a rolling pin to crush them into a smooth enough powder. If done, mix the butter, cocoa powder, rum, lemon juice, conserve and sugar with the crushed biscuits until smooth and gets an even colour. Once that is done, taste – depending on preference, add more sugar if not sweet enough, if it is too runny add some more crushed biscuits, if too hard then add more butter. Take a plate and put 1 or 2 tbsp of the dessicated coconut on it. 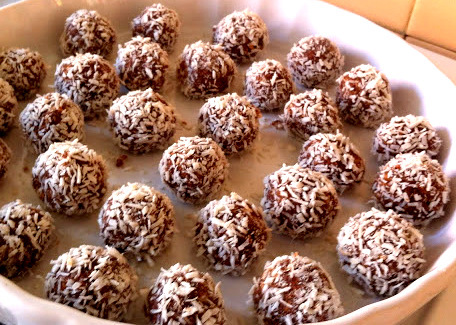 Form little balls out of the chocolate mixture and dip them in the coconut.